NETGEAR's Arlo camera security system is the company's second attempt at packaging the technology acquired with its purchase of Avaak into an easy-to-use home cloud-based video surveillance product that is easy to set up and maintain. The first attempt was VueZone, which you can still buy, but is not compatible with its latest Arlo product I'm reviewing today. Arlo's key improvements vis-a-vis VueZone are better video quality and a more weatherproof case. The kit I received for review comes with a 2.4 GHz 802.11n base station, wall-wart power adapter, Ethernet cable, two Arlo cameras, four magnetic camera mounts, and eight CR123 lithium batteries that retails for $349.99. You can also get a four camera kit for $499.99, three camera kit for $449.99, one camera kit for $200 and individual cameras for $160 a pop. Arlo was different than other cameras I've reviewed because it comes with its own wireless base station. NETGEAR designed Arlo with its own base station for ease of setup, possible future functionality (local recording perhaps?) and special Wi-Fi power settings designed to maximize camera battery life. The base station is based on Broadcom's BCM5358 wireless router SoC with 500 MHz MIPS 74 K processor, 128 MB of Flash and 128 MB of RAM. 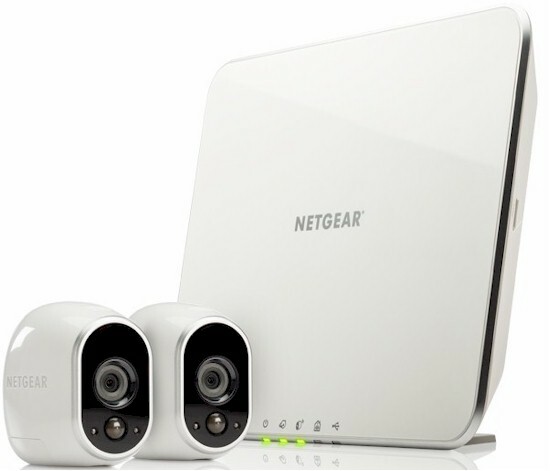 The base station runs its own 802.11n 2.4GHz wireless network that can support up to 10 cameras. There are also two USB ports on the base station that have no purpose presently, but that NETGEAR forums mention may be for future use. The photo below shows the top side of the Arlo board with its two USB ports, Ethernet jack and power. The Arlo cameras are 720p HD weatherproof cameras using H.264 compression. The cameras are completely wireless, which makes installation a snap. Each camera has 4 CR123 batteries that never dropped from their full reading despite being set to the Best Video setting during three weeks of testing. That said, Amazon reviews show some customers having battery problems with Arlo, especially in cold weather. NETGEAR responses to the reviews indicate there was a software bug that incorrectly reported battery level in the cold. But it is safe to say batteries may run down faster as temps get very cold. Arlo's operating temperature is spec'd from 14° F to 122° F. NETGEAR says Arlo batteries should last 4-6 months with 4 minutes of daily use on the Optimized setting. As a quick test, I put an Arlo in my refrigerator's freezer. Granted, being in the freezer caused only a few motion triggers a day. But at the end of a week's time, it still showed a full battery (all bars). The table below shows the key information collected for cameras; blanks indicate unavailable information. Setting up the Arlo system was very easy. The Quick Start Guide shows it can be set up via browser or by mobile device such as Android or iOS. I chose to set up via my Samsung S4, which entailed first getting the Arlo app from the Google Play Store. The app guided me to choose New System Setup, set up a new account and plug the base station into my network where it picked up an IP address by DHCP. Next, I put the batteries into the two cameras and brought them within 12 inches of the base station to be synced. The range of the base station is 300 feet and tested to work well in that range, but syncing requires closer proximity. The cameras were found and added to my newly created account. Knowing the base station was 2.4 GHz 802.11n and suspecting the sync was actually WPS, I also hit Sync on the base station and WPS pushbutton on my Android phone, but the connection did not complete. The image below shows the setup camera sync step. Once set up, live and recorded video can be accessed via the Arlo app or any browser. The cameras themselves talk to the base station with AES-128 bit encryption and Transport Layer Security (TLS). On the cloud side, strict passwords are required, authentication happens over an HTTPS connection and login attempts are limited to 5 attempts over 5 minutes. The cameras are truly wireless, using batteries and a wireless network. A strong magnet is present in the back of the camera for easy mounting. Simply screw the magnetic base to the wall and then pop the camera on by magnet. A more secure and permanent solution can be purchased for about $27, which takes advantage of a tripod thread in the base of the camera. The image below shows the included magnetic mounting solution.